Since the global financial crisis started there has been a debate about how much of the increase in unemployment is cyclical versus structural. Arpaia and Turrini summarize the results of their analysis of the EU labor market in a recent Vox post. "...a major drop in matching efficiency was recorded in 2009 in most countries. Unsurprisingly, matching efficiency has been falling mostly in the countries that witnessed a marked outward shift in the Beveridge curve, although some signs of stabilisation or even recovery are visible by 2013Q1"
They then try to understand the reason for matching efficiency to decline and they test several hypothesis: mismatch in skills, industry or regions. It is interesting that although the three play a role in the full sample none of them are statistically significant in the post-2007 period (only skills mismatch is close to being significant). But out of the controls that they introduce in their regressions, there is one that shows up as a strong determinant of the change in labor market efficiency: the change in long-term unemployment. In other words, one cannot reject the view that a deep recession resulted in a large increase in cyclical unemployment that turned into long-term unemployment because of the duration of the recession and this has led at a decline in the efficiency of the labor market. This is not far from what Blanchard and Summers (back in 1986) labelled as hysteresis in the labor market when describing the performance of also European labor markets in the 70s and 80s. The added insight of Arpaia and Turrini is that the difficulty in reducing long-term unemployment is related to the effect that its high level reduces the overall matching efficiency of the labor market. 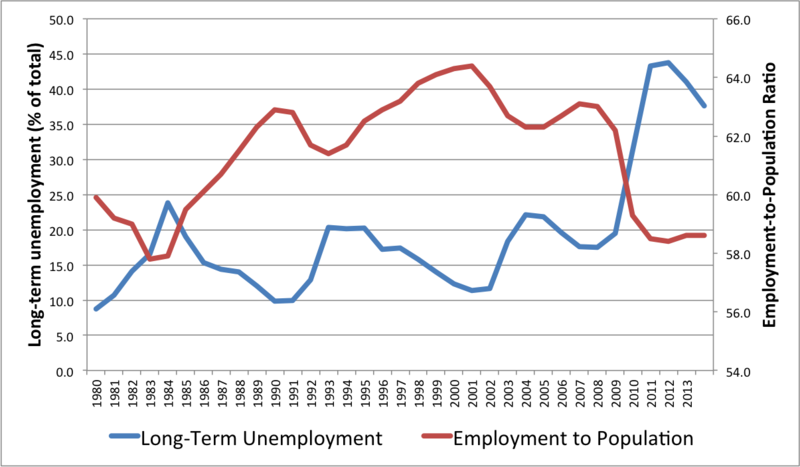 The role that long-term unemployment and hysteresis could be playing in the US during the current crisis relative to more structural factors is also a source of debate. What is clear from the data is that the increase in long-term unemployment during this crisis is a lot more pronounced than in any previous crisis, which matches well the deterioration of other labor market indicators (such as the employment to population ratio). Global interest rates and growth (r-g). The difference between interest rate and growth rates appears as an important parameter in many macroeconomic models. It is also a key variable to assess the sustainability of public finances: higher interest rates make the cost of carrying over debt higher while high growth rates help keep the debt to GDP ratio under control. In a recent post Floyd Norris criticizes the assumptions used by the US Congressional Budget Office for its fiscal projections because they are assuming lower growth rates ahead but a return to "normal" interest rates. The point that Norris makes is that we tend to think that interest rates and growth rates are correlated, so if growth is going to be much lower going forward we should also forecast lower interest rates (and this will make the fiscal outlook look more positive). Paul Krugman initially supports Floyd Norris' arguments but later, after checking the data, he realizes that growth and interest rates are not that correlated. Here is the picture of the difference between interest rates and growth rates for the US (from Krugman). 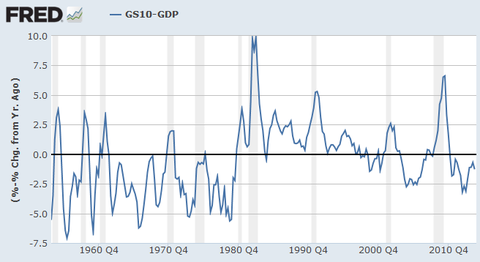 The relationship between interest rates and growth rates shows no clear pattern in the chart. During the 60s interest rates were lower than growth rates (when growth was high). We see a similar pattern in recent years but in this case growth is low. The 80s stand out as a period of high interest rates compared to growth (and growth was around its long-term average). To understand better how the pattern above matches that of GDP growth, here is World growth in each of these decades (measured both in real terms -constant US dollars- and nominal terms - current US dollars). What is the World pattern of growth and interest rates? 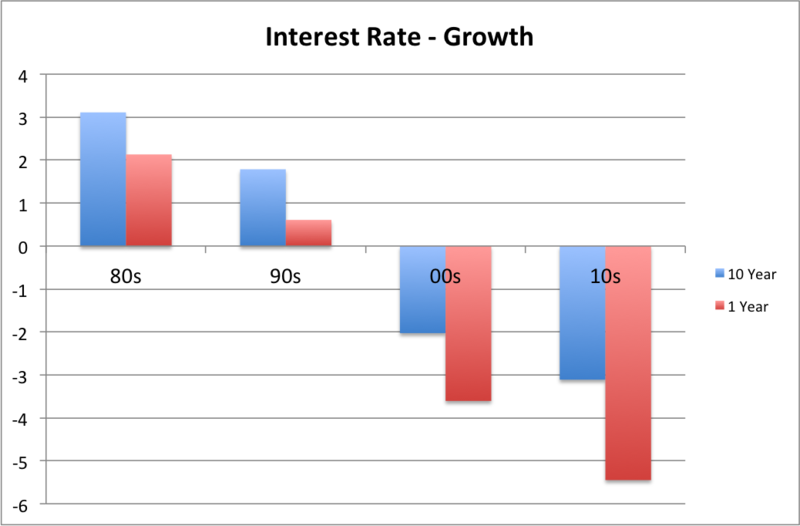 As in the US data, the relationship between interest rates and growth rates has varied over the past decades. 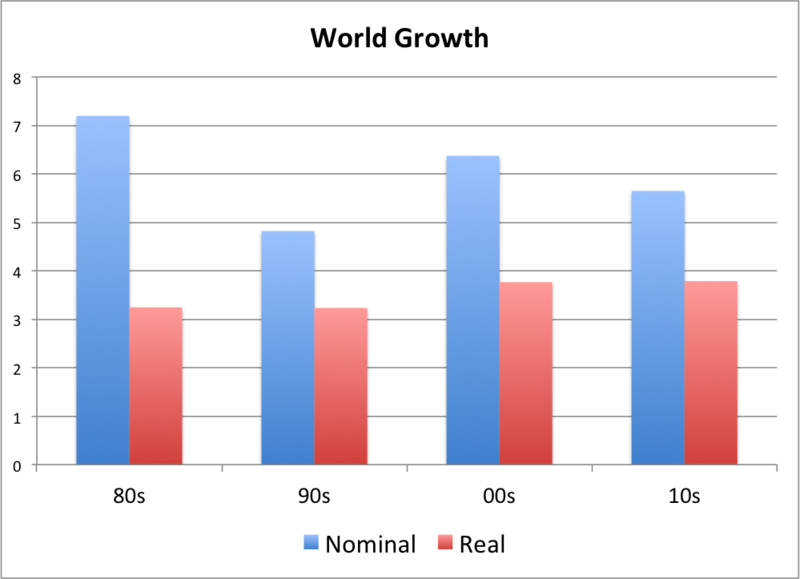 Real growth is stable across all decades although increasing after 2000 (because of emerging markets). The 80s stands out as a decade with very high interest rates relative to growth. The 2000s and the 2010-13 period are characterized by very low rates relative to growth (while global growth remains strong). What determines interest rates then? The usual narrative of the post 2000 sample is that of the saving glut that stars in the late-90s with the increase in saving rates in regions like Asia (partly as a response to the Asian crisis). Theoretically, such a global shift in saving should lead to lower interest rates and increasing growth rate in the world. In summary, given that interest rates are determined by global conditions, anything could happen when comparing them to growth rates for a given country (of course if the country is large enough to influence global variables then national and global conditions are correlated). The right way to look at these two variables is at the world level. But the empirical evidence confirms that, even if we look at a global level, one cannot rule out future scenarios of movements in interest rates and growth rates in opposite directions (they still need to be justified in terms of the global dynamics of investment and saving, but they are possible). Financial markets arbitrage: reassuring or lovely? It is lovely to see the effect of "arbitrageurs" making markets "more efficient." As an academic I enjoyed reading the post as it provides a very nice example of a clean empirical test of how high frequency trading makes the comovements of two markets stronger. This is what we look for in academic papers, a clean test of a very simple theory that produces very credible and robust results. But as much as I enjoyed reading the post, it also reminded me of how limited is the ability of academic research to help us understand phenomena that really matter. In this particular case, the analysis compares the price of the same security in two nearby markets (geographically but also linked by very fast communications). As communications and trade become faster and faster, price deviations between the two markets disappear in a shorter period of time. This is really nice to see but is this a big surprise? One would expect that at a minimum, very basic arbitrage opportunities do not exist in integrated financial markets. So it is reassuring that arbitrageurs help markets be more efficient but I am not sure I would go as far as saying that this is "lovely". What would be more interesting (at least to me) is understand whether high frequency trading helps getting financial prices right. And by "right" I mean prices that are consistent with economic fundamentals, prices that do not generate volatile dynamics and bubble-type behavior. If we could prove that this is the case then I would find the result "lovely".